Knight plate arms of the 2nd half of the XIV – early XV century are classical protection of warriors in those times. By default, all three parts of plate arms are joined with steel rivets. If you want these parts to be combined with leather straps (as plate arms with brass strips on the photo), please advise us when ordering. Leather belts with buckles allow perfect fastening of the guard on your arm. This medieval armor should be worn over padded gambeson for more safe and comfortable usage. In options, you may choose another type and thickness of metal, color of belts, finish treatment and decoration for your authentic arm defense. 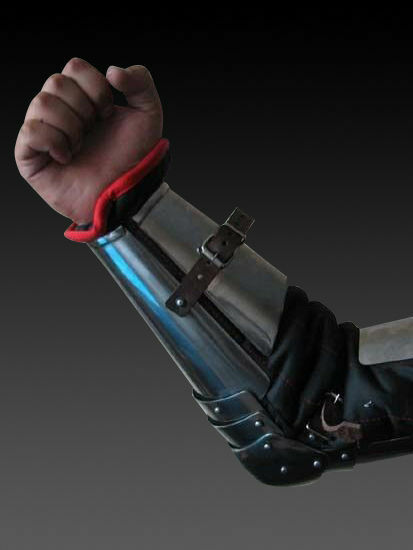 You may also like similar models of steel arm protection: medieval bracers 1390-1430 years; Milan style plate arms with couter 1450-1485 years. SCA and sport arm protection is the best choice for fighters, who do not strive for 100% historical authenticity, but want to have 100% defense during practicing in sport and medieval fencings. This arm guard is not a replica, but a type of armor, which was specially designed for SCA fighters. It covers only outer part of arm. 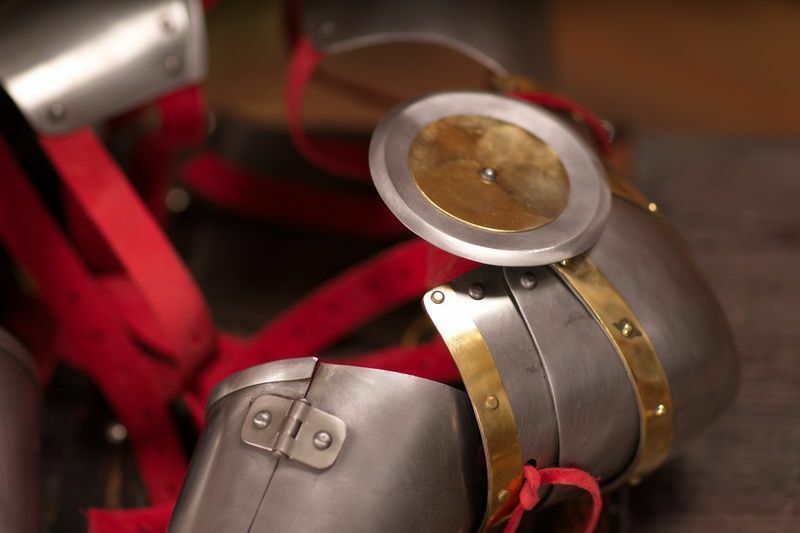 Arm armor consists of three parts: Rerebrace (protection of bicep/upper part of arm); Vambrace (protection of forearm); Couter (elbow cap) with rondel All elements of this sport defense are joined together with leather belts and rivets, which make SCA armor good articulated. Also, defense has belts with buckles for reliable holding on the arm. There are holes on the upper part of rerebrace, so you could attach plate spaulders by your wish. You can use this plate arm defense for: SCA HEMA Larp Stage performances Medieval festivals Reenactment events Base price includes following options: Cold-rolled steel 1.0 mm; Satin polishing; Brown leather belts; Ste..
Elbow caps with plain rondel is an element of knight battle outfit. Quite often, cap was supplied with circle plates, attached to the outer side of cap – a rondel, for additional defense. Handcrafted couter is fastened with leather belt and buckle on the elbow. It is recommended to wear such armor only over padded gambeson. 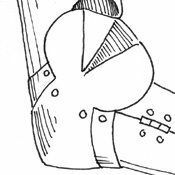 There are holes on the top edge, so you may additional tie steel elbow cap up to your medieval doublet. You can use this functional joint armor for: SCA HEMA Larp Stage performances Medieval festivals Reenactment events Base price includes following options: Cold-rolled steel 1.0 mm; Satin polishing; Brown leather belts; Steel nickel-plated buckles; Steel rivets; No decoration; Painting inside Main photo shows steel elbow protection with following options: Cold-rolled steel 1.5 mm; Mirror polishing as finish treatment; Steel rivets; Painting inside In options, you may choose another type and thickness of metal, color of belts, finish treatment an..
Handcrafted elbow caps with chased rondel is an important element of battle knight outfit. 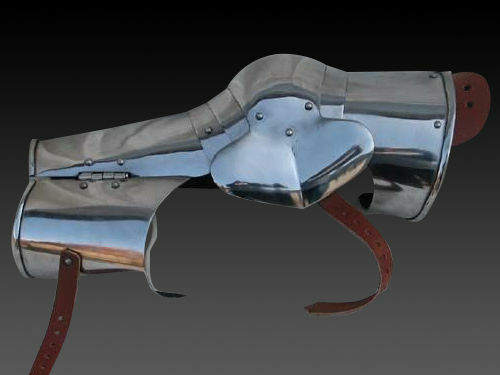 Steel elbow guards was in wide use among knights since the XIV century. 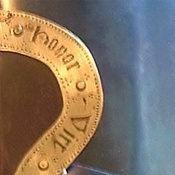 Primarily, such caps (also known as couters) were attached to mail sleeve of hauberk, later on they became a part of full arm protection. Elbow defense has a circle plate (rondel) for protection of our part of elbow. Caps are held on the elbow with firm leather belts and buckle. Leather loops with holes are installed on the top of cap and allow lacing to the rerebrace (armor for the upper part of arm) or padded gambeson. You can use this functional elbow armor for: SCA HEMA Larp Stage performances Medieval festivals Reenactment events Base price includes following options: Cold-rolled steel 1.0 mm; Satin polishing; Brown leather belts; Steel nickel-plated buckles; Steel rivets; No decoration; Painting inside Main photo shows steel handcrafted elbow protection with following options: Cold-rolled steel 1.5 mm; Mirror po.. When a man requires cool medieval armor of the end XIV – early XV centuries, so there is only one place, which will be a source of knowledges and samplings – Diagon Alley… Ah, we're just kidding! We are talking about Churburg Castle. The Castle Complex Churburg on the North of Italy is dated XII-XVI centuries and keeps one of the largest collection of medieval armament. Any reenactor knows about this wonderful place and proudly wears replicas of exhibit items from the local collection. In our turn, we decided to gladden our customers, by assigning our artisans to make a replica of bracers of the 1390-1400 years from the Churburg Castle. 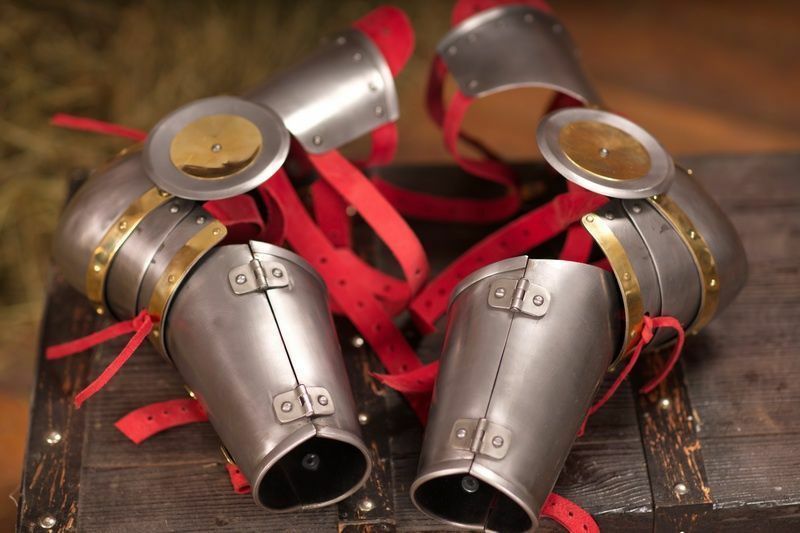 *** This classic model of the medieval arm armor is one-of-a-kind in its elegance and reliability. It consists of two halves, fastened together with hinges and buckle. Upper part of the longer half is completed with belt for attaching of elbow protection. This medieval forearm armor is as an essential part of plate armor, as Chapel-de-fer and g..
Every profession has its own nuances. Baker should have good knowledge of flour, a tailor has to master his fingers faultlessly, but Witcher has to kill every unfriendly creatures fast and effectively. Quite often, he does not only have to brandish a sword and throw the signs, but punch a foe with elbow to the point. Elbow stroke is not as easy as it might appear at the first sight. Complicated balance of power and accuracy of the blow are very important here. And one shouldn’t forget that some monsters are not only armored but also have toxic skin. That’s why any witcher can’t be without light, firm and comfortable elbow caps. 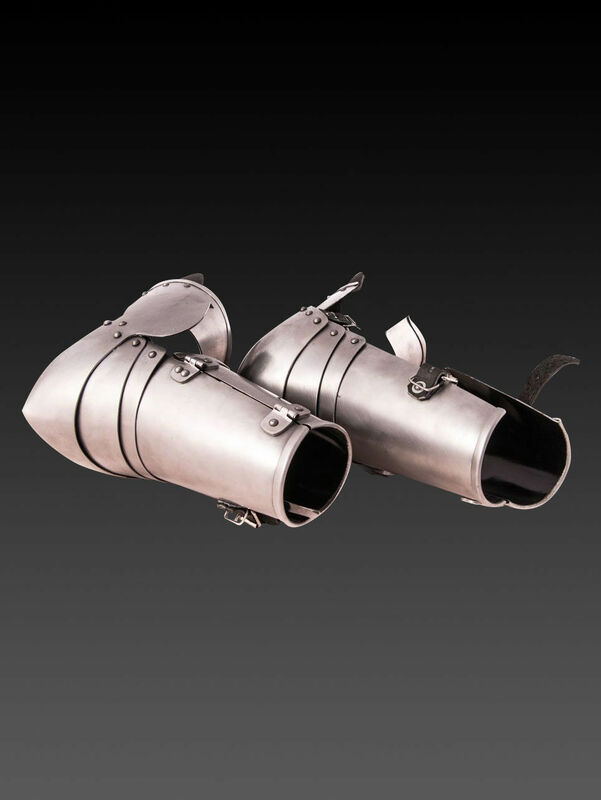 Just like the elbow caps from game “Witcher”, which are presented in Steel Mastery now. They are simple and troubleproof, so can’t be broken. They are laconic and classy, so will be appropriate for any battle outfit. They are light, so will not hinder your movements. For real connoisseurs and aesthetes, type and shape of rivets, colour of belt, type and metal of buckles as well as method of fi..